Welcome to the home of the Lake Monticello Swim Team (LMST). We are a summer swim program and participate in the Jefferson Swim League (JSL), an 17-team league divided into three divisions. We are located in the Lake Monticello neighborhood in Palmyra, VA. Membership is open to anyone who is 5-18 years old (age as of June 1st, 2019) provided they can swim a length of the pool (25 yards) unassisted. Swimmers do not have to be a Lake Monticello resident or have a pool membership to participate on the team. However, access to the pool will be limited to practices and meets. Although we swim competitively against other teams, our main goal is to HAVE FUN! Our coaches’ mission is to teach and improve our swimmers’ skills and confidence in the water while promoting team spirit and sportsmanship. 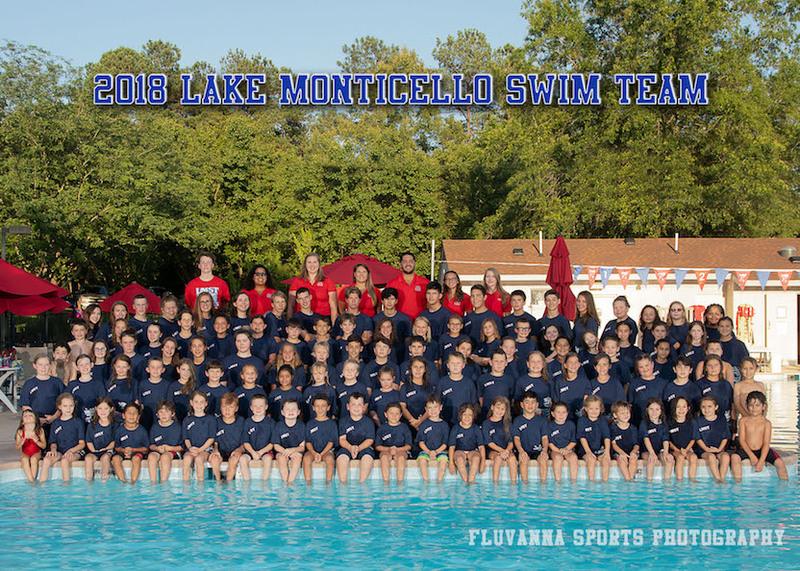 LMST is a family-oriented program and we welcome new swimmers of all levels! Kickoff Registration for the 2019 season will be held on Sunday, March 24th 2:00 – 4:00 pm on the lower level of the LMOA Clubhouse, Ashlawn Blvd, Palmyra VA 22963. The registration fee of $155 includes spring warm-ups and a team t-shirt (if registered by May 6th). Registration is completed online and paid using Paypal. Cash, check or credit will also be accepted. Additionally, you can register at any time by clicking on the 2019 LMST REGISTRATION FORM link at the top of this page. If a swimmer is not participating until outdoor swim begins on May 28th, there is an option in the registration form to pay later. We ask that all swimmers get registered as soon as possible (and before May 6th) in order to secure the correct sized team t-shirt. After May 6th, LMST cannot guarantee that a correct size t-shirt will be available. For liability reasons, no participant will be allowed to get in the water without having a completed registration form and payment on file.